My name is Ghost. Well, not really but I dont have a name so that’s what they’re calling me because I’m pretty good at disappearing. I’m probably just over a year old. I was in a home for about 4 months and I was so scared. They fed me adult iguana pellets and didn’t give me any lights. Now I’m in the rescue and I have a whole room to play in with my new friends and these great warm lights. I’m still really scared of people but I’ll get better. They are almost positive I’m a boy but I’m still too young to know for sure. I’d really love to find a forever home where I can settle down and bond with a loving owner. My adoption fee would be $30. My name is Little One, because I don’t have a real name either. I’ve been at the rescue for several months. I’m still a bit crazy but I’m getting better. I will try to run or tail whip when you first come near me but once I’m in your hands I calm down. I am likely a female and probably around 2 years old. 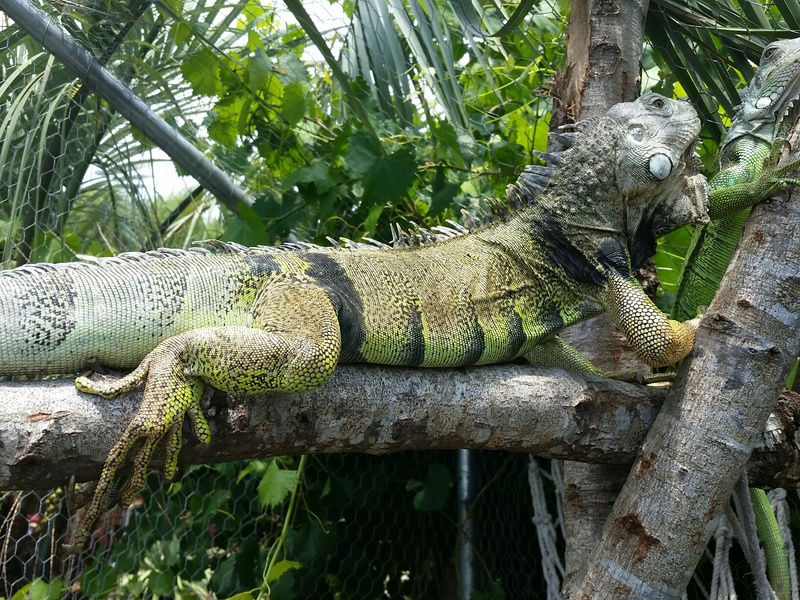 I hang out with the other small iguanas here but I really don’t get along with them. I’d love to find a home where I can get lots of individual attention. My adoption fee would be $30. 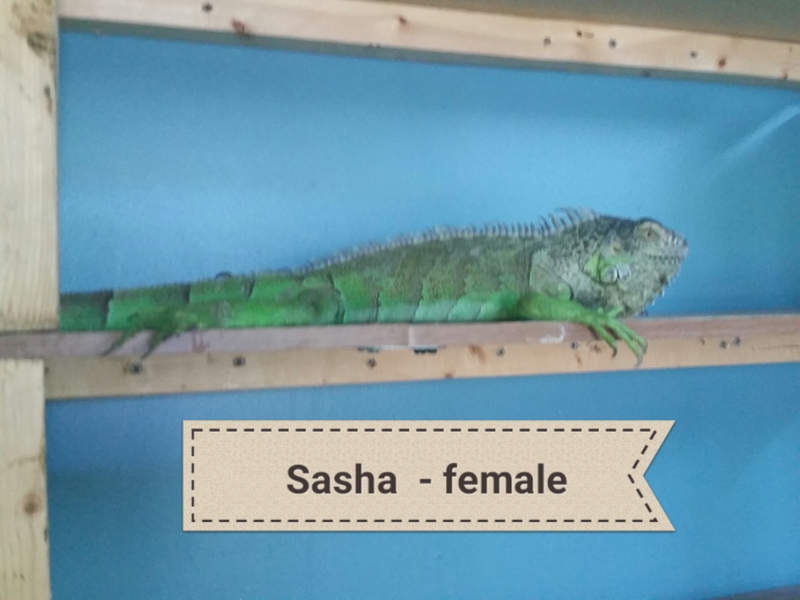 My name is Sasha and I am likely a female. I am around 2 years old and I have lots of cool spots all over me. 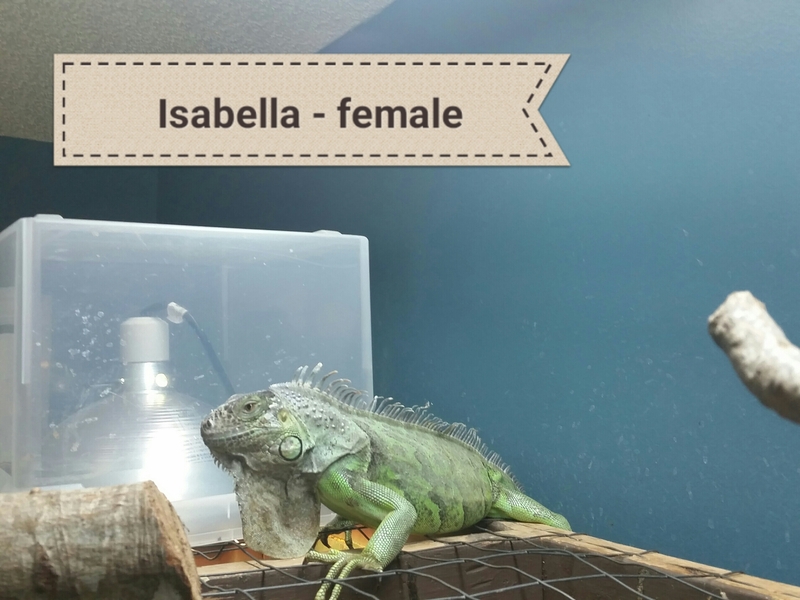 I’m not crazy about people and I’m really good at tail whipping and escaping, but given the chance in a loving home with no other iguanas, I’m sure I would calm down and become a great pet. All I need is a chance and the right family. I love to free roam in my own bedroom. My adoption fee would be $30. My name is Isabella. I am a female and probably around 3 years old. I should be ready to lay my first set of eggs soon especially now since I’m in this great room with lots of light and humidity. 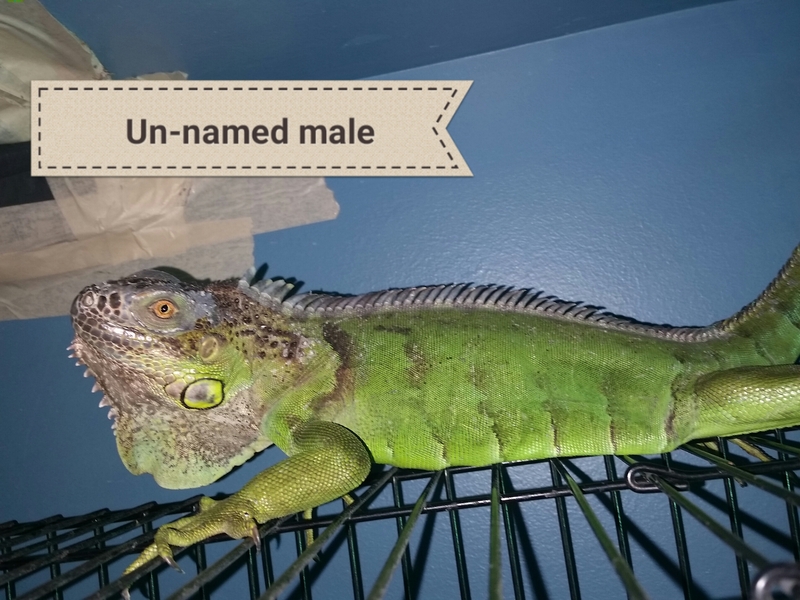 My original owner got me from a pet store but he passed away and I came to the rescue. I’m the newest here and I’m still scared but I have a lot of potential to be an amazing pet. I really just need the right family and lots of love. My adoption fee would be $50. My name is Izzy and I am about 6 years old. I am male and have been at the rescue for quite a long time now. I was really mean when I got here and I’ve calmed down quite a bit, but I still have my moods. I am very special to mom and dad and they aren’t even sure they want to adopt me out. The problem is that Shamus hates me and has tried to attack me more than once. Even Wilma picks on me at times. I am usually good with the baby iguanas, except when I go into season and become very dominant. I’m a great eater but I have a slight deformity inside my mouth that requires mom to clean the old food out once in a while. I love the freedom of having my own room and I’m really good at escaping a cage if you try to lock me up. The person who adopts me would have to be really special. As much as mom and dad love me, I would probably flourish in a home with no other iguanas. My adoption fee would be $100. Hi I would like to adopt an iggy from your rescue. What are the procedures and is the website current? Also I live in georgia. Thanks! I have an application you’d have to fill out and I’d need to see where they would be staying (in pictures if needed). I do not ship so you’d also have to be willing to drive up here to get the iguana. email me at nspencer.work@gmail.com if you are still interested. I would be interested in adopting if possible . If I could get more information that would be great. Hi Ricky, please use the form on the contact us page to email me directly. I’d love to talk to you and for you to come and meet them. Hello your babies are all lovely and soo lucky to have found your rescue!!! What great stories! Id love to adopt!! However im in Canada?an hour North of Toronto. Likely too cold atm to ship. Do you ship? Or wld it be too stressful on the chosen ig?? Ghost is super cute and ive been after a little one for awhile lol. Just didnt want to go the pet store route if i can offer a needy ig a home through rescue i prefer that. I have two males. Ziggy is six and a green. Pretty easy going big guy even though its breeding season lol. Zane is either a green or some sort of red morph? Was listed as a red female but turned out to be male after a good bath and a look see lol. He was in TERRIBLE shape. Poor lad. Were getting there tho! Hi Allisson, thank you for your comments. I don’t offer shipping currently. I believe it is very stressful on the animal and there is no telling what happens to them during transport. I’m also uncomfortable just sending him off without knowing where he is going. 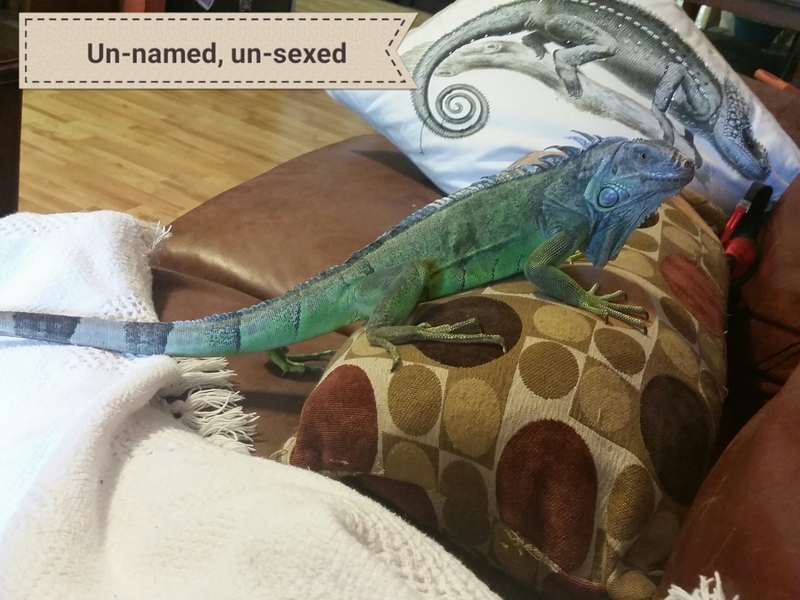 I have so many iguanas right now and no real prospects of homes close by so my shipping policy might have to change in the future.